The mirror has single curvature on its surface. 1. Rotate the mirror adjusting switch to the left or right to choose the left or right side mirror. 2. Depress the mirror switch in the appropriate direction. 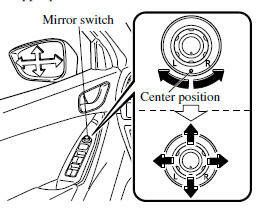 After adjusting the mirror, lock the control by rotating the switch in the center position. Driving with the outside mirrors folded in is dangerous. Your rear view will be restricted, and you could have an accident. Fold the outside mirror rearward until it is flush with the vehicle. Cargo stacked higher than the seatbacks is dangerous. It can block your view in the rearview mirror, which might cause you to hit another car when changing lanes. Before driving, adjust the rearview mirror to center on the scene through the rear window. 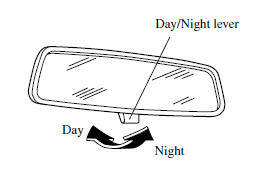 For the manual day/night mirror, perform the adjustment with the day/night lever in the day position. Push the day/night lever forward for day driving. Pull it back to reduce glare of headlights from cars at the rear. The auto-dimming mirror automatically reduces glare of headlights from cars at the rear when the ignition is switched ON. Press the OFF button ( ) to cancel the automatic dimming function. The indicator light will turn off. To reactivate the automatic dimming function, press the ON button ( ). The indicator light will illuminate. • Do not use glass cleaner or suspend objects on or around the light sensor. Otherwise, light sensor sensitivity will be affected and may not operate normally. 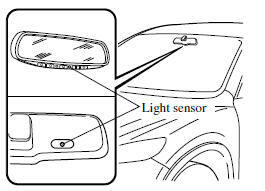 • For information regarding the 3 buttons ( ) on the auto-dimming mirror. Refer to HomeLink Wireless Control System 3. • The auto-dimmer function is canceled when the ignition is switched ON and the shift lever/selector lever is in reverse (R).